Holly Springs School has an amazing Developmental Program created just for your Two Year Old! Our curriculum incorporates a Montessori-like math, vocabulary expansion practices, along with student-initiated learning activities. Research has demonstrated that during this developmental stage, children learn math concepts such as size, shape, quantity, and patterns using manipulatives. Our lesson plans reflect these benchmarks and incorporate them in both formal and informal instruction time. Each month our math curriculum introduces new math concepts like number recognition, becoming familiar with quantity, sorting and classification. We have worked diligently to create a ‘CAN DO’ classroom at Holly Springs School. Our two-year-olds learn how to clean up spills, put away personal belongings, set the table for lunch and much more. At this age, rapid movement and exploring independence are predominant. We designed our classroom that creates many opportunities to discover the world around them. Our teachers go beyond the custodial care of feeding, diapering and safety. They focus on reaching development milestones in the areas of human affection, age-appropriate guidance and creating the environment for lifelong learning. 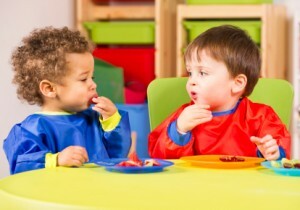 For two-year-olds, building a solid foundation for social skills is valuable. It is during this time that development is enhanced through greater interactive rather than parallel play. Our program provides a balanced approach in the classroom that engages the whole child with a blend of music, art and comprehensive movement. As well, the early education fundamentals for socializing are practiced, readying them for smoother transitions as they continue toward preschool. Our curriculum director works hand-in-hand with the lead teacher to ensure that the each child receives the highest quality programming. Holly Springs School for Early Education has plenty of healthy snacks and friends! At Holly Springs School for Early Education, each child’s progress is carefully monitored by using individualized goals and objectives. These measures invite parental input and participation— as we understand the importance of parental involvement in successful development. Parents can review these goals and objectives during annual parent/teacher conferences, or as requested. We further encourage parental participation through our monthly “Family and Me” class. Daily reports are issued for each child, giving an overview of the activities, new discoveries and potty training progress. We offer quality programming, which includes low teacher turnover (avg. of 3yrs, experience with Holly Springs School); individual care plans; daily reports; daily outdoor play or buggy walks; Sign Language; monthly Family and Me Days; Community Visitors who aid in our curriculum implementation; cooking projects; healthy menus- including fresh fruit and vegetables. We are the only area pre-school that uses Gluten Free art products. Our teachers take great pride in creating a classroom and atmosphere that is conducive with higher learning, guided and free- exploration. Their individual knowledge of key developmental targets makes their instruction intentional, leaving room for program flexibility. We take create care in our efforts to balance direct and experiential learning. The children are able to excel in our educationally rich and equally exciting classroom. We practice and believe in EXCELLENCE!